Getting to Santa Marta: The best ways to get to Santa Marta, Taganga,Tayrona National Park and more. 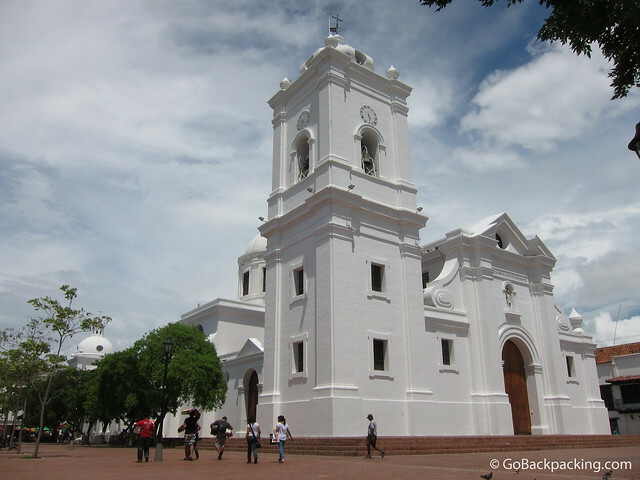 Getting Around Santa Marta: The best ways to get around Santa Marta, the amazing Colombia beaches, and the coastal area. Where to Stay in Santa Marta: Find the best hotel in Santa Marta, or hostel in Santa Marta to suit your budget, sample rates provided here. Things to Do in Santa Marta: The best things to do in Santa Marta, and around Santa Marta. Scuba Diving, Colombia beaches, Ciudad Perdida Trek, Tayrona National Park and more. Food & Drink: What to expect in terms of food and beverage along the Colombia beaches and and the city of Santa Marta, and sample prices. Nightlife: Bar scene in Santa Marta. What to expect in the way of nightlife in this Colombia beach town. Interested in the “Lost City” Ciudad Perdida Trek? At first glance, Santa Marta does not impress. Instead of a destination unto itself, most foreign tourists use it as a base camp for exploring other points of interest along the coast, or the famous Ciudad Perdida Trek. The attractive city center is much smaller than Cartagena, and the beaches can't compare to the natural beauty of Playa Blanca or Parque Tayrona. But if you give it a chance, a few days without judgement, you may find the charms of this small coastal city growing on you. Santa Marta is served by the Simon Bolivar Airport, located along the beach, about 20 minutes south of the city center. To get to your hostel or hotel from the airport, take a taxi for about 45,000 to 50,000 pesos ($15 – $17US). If you're heading straight to Taganga, expect to pay 50,000 to 60,000 ($17 – $20). If you notice other backpackers from your flight, ask if you can share a taxi to split the cost. Santa Marta's main bus station is outside the city center, and offers regional and long range buses to destinations around the country. Regular buses leave for the 2-hour trip to Barranquilla, and it's a 4-hour ride to Cartagena further west along the coast. It's about a 12-hour ride to Medellin. When leaving the city, you can usually show up and find a bus departing within a few hours for wherever you're headed, especially if it's another major city such as Cartagena or Bogota. The exceptions are national holidays, such as Semana Santa in April and the month of December, when larger number of Colombians are taking vacations. Private minivan services also serve the coast. They are more expensive than the regular buses, but faster, and more comfortable. Your Santa Marta hostel or Santa Marta hotel can help you book them. Check out this “door-to-door” transfer from Santa Marta to Barranquilla for $28.00. Well preserved Spanish Colonial architecture in the city center. Santa Marta's city center (centro) is small, and best experienced on foot. Take a tour: The Santa Marta Sightseeing Tour goes by bus to La Quinta de San Pedro Alejandrino where Simón Bolívar died, and where you’ll also learn about his fascinating life. The tour continues to Taganga, known for its spectacular sunsets and is one of the most pristine Colombia beaches. 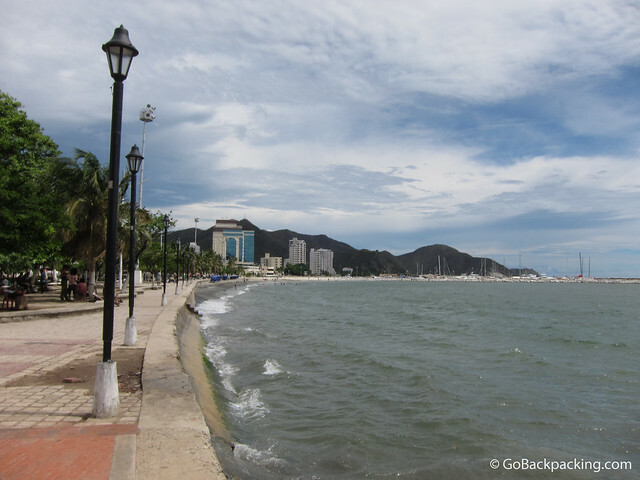 Upon returning to Santa Marta, the tour continues on foot to see the city landmarks. Prices from $37.00US, click here to learn more! Taxis are an easy and inexpensive way to get around the larger metropolitan area, including the upscale suburb of Rodadero to the south, the fishing village of Taganga to the east, and the airport. Taxis in Santa Marta do not have meters, so be sure to confirm the price in advance, and try to bargain a little. Taxi drivers along the coast are more likely to quote inflated prices on account of all the tourists. A plethora of private buses, big and small, ply the city streets and can take you just about anywhere you need to go. The bus routes are posted in the front windows, and feature major landmarks, universities and shopping centers to help you get your bearings. Flagging a bus is as easy as holding your hand out as it approaches. To get off the bus, look for a red button on the inside to push, or if you can't find one or it's not working, alert the driver that you want to get off. The average cost of a ride is about 2,400 pesos ($0.80). 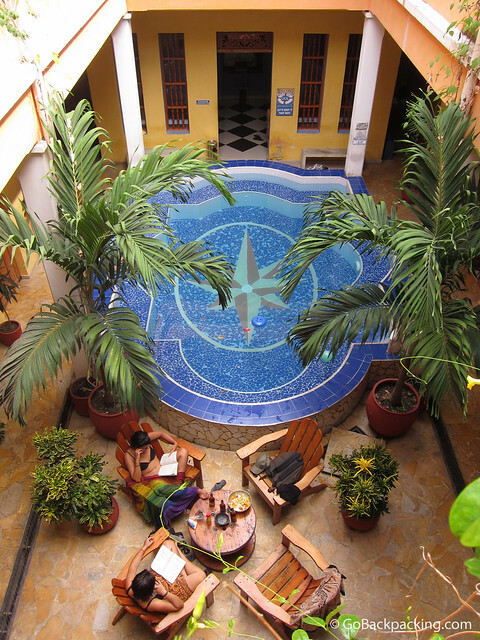 Backpackers at La Brisa Loca have the option to cool off in the hostel's ground floor swimming pool. 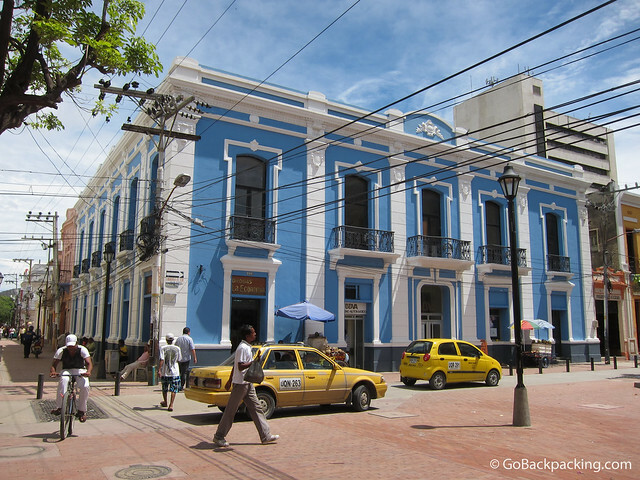 The main backpacker neighborhood is located in the historic city center (Centro), and is likely the top choice when deciding where to stay in Santa Marta. However, depending on your adventure, just as many backpackers prefer to base themselves in the upscale suburb of Rodadero, or the nearby fishing village of Taganga. So are you looking to enjoy some Colombia beach time? Take Spanish lessons? Go Scuba diving in Taganga? Taking the Ciudad Perdida Trek? See below for some of the best hotels in Santa Marta and hostels in Santa Marta according to your budget and adventure. We used Hotels Combined to find the best deals for hostels in Santa Marta (and hotels in Santa Marta). Hotels Combined is a meta-aggregator that scours all the main booking sites to find the best price, so we have found it to be the perfect place to start. La Brisa Loca – Pictured above. A Large, historic 2-story building in the city center. The ground floor includes a pool, and the rooftop is a popular hangout in the evenings. The 2nd floor bar is party central. Despite the central location, the possible downside is it's a party hostel, and can get very loud at night and on the weekends. But if you're up for a party, this is the hostel for you! El Hostal de Jackie – Another fab hostel with a swimming pool and terrace with a bar right in the historical center of the town. Walking distance to the beach, as well as landmarks like the cathedral and Museo del Oro. Shared kitchen facilities, breakfast included with private room rates, very convenient to explore Santa Marta and the coast. The Dreamer Hostel – Located about 15 minutes outside the city center, and they boast being the closest hostel to Tayrona Park. This hostel was recommended to me by several friends, one of whom is a writer for Lonely Planet. As such, it is very highly rated with a restaurant (Italian) and bar onsite, a swimming pool, shared kitchen, BBQ and lots more, it’s hard to wrong here. Hotel Mar Azul Inn – If you want some great Colombia beach time, and if your budget will allow it, this is a great 3-star option in El Rodadero just south of Santa Marta, with the beach just a three minute walk away. Lots of restaurants and bars nearby, Santa Marta center is about 10-15 minute drive, $5 – $7 in a taxi, or 3000COP ($1US) by bus. For great places in Taganga, check out Hostel Villa Mary, or La Tortuga Hostel. Both are reasonably priced, and very well located within a few minutes walk to one of the best Colombia beaches and plenty of restaurants nearby. If you plan to spend a few weeks, or months, in the city, then you'll want to rent a room or apartment. CompartoApto.com offers free listings for rooms and apartments, most of which are offered by Colombians for 375,000 – 800,000 pesos per month ($125 – $270), utilities included. Couchsurfing is another option which can help you save money, and give you a chance to see the city through a resident's perspective. As most Colombians live with their parents until married, it may be hard to find a place to stay, however you may be able to meet up with locals for coffee or a drink. Click here to learn more about Couchsurfing! Santa Marta's more of a hub for planning your next adventure like the Cuidad Perdida Trek, or exploring some splendid Colombia beaches, than a destination in and of itself. There's not much to see or do within the city itself. Check out the old Spanish Colonial architecture by going for a casual walk around the city center. Taganga – Take a 10-minute taxi ride over a mountain to arrive at this small fishing village, and backpacker favorite. Taganga is filled with dive shops, and it's possible to get your PADI open water certification for about $300. Parque Tayrona – A national park where the unspoiled jungle meets the sea. An easy, 30-minute hike through the jungle, plus another one or two hours walk along the beaches will bring you to the tropical paradise that is El Cabo. Any hostel or hotel in Santa Marta can help you arrange transport to Parque Nacional Tayrona, or just take a taxi. A daily, 45-minute to 1-hour speedboat service is also available from/to Taganga for 40,000 pesos ($22). Ciudad Perdida (The Lost City) Trek – This 5 or 6 day jungle trek to old ruins is incredibly popular with backpackers. While not particularly strenuous, trekkers must be willing to get wet and dirty. La Guajira Peninsula – Several tour companies in Santa Marta can arrange 2+ night trips to Cabo de la Vela and La Guajira Peninsula. This desert region forms the northern tip of Colombia, and the South American continent. It's inhabited by the indiginous Wayuu people, who are known for making high quality woven bags and hammocks. Tours can be expensive ($250+), and a third of the driving is off-road, however if you want a beautiful beach all to yourself, this is the adventure for you. There are a couple great organized options, a 4 or 5 day Ciudad Perdida Trek, or a 7 Day Ciudad Perdida Trek offered by GAdventures. Like Cartagena, Santa Marta offers an array of restaurants to feed hungry visitors, with many of the best located within the historic old city. The city's proximity to the sea ensures fresh seafood is widely available. However, be aware that the high heat can lead seafood and crustaceans to go back quickly, leaving travelers to recover from unexpected bouts of traveler's diarrhea and food poisoning. Ceviche – Raw seafood fans will delight in the availability of fresh ceviche, from vendors selling small cups on the beach to nicely presented dishes in the city's restaurants. Arroz de coco (coconut rice) – Coconut makes everything better, and this flavored rice is a coastal favorite. Fresh fruit & juices – Keep yourself cool by sampling the wide variety of fresh tropical fruit and juices available throughout the city. Buy your mango, watermelon, and maracuya from street vendors to keep costs down. Pargo (red snapper) – Served whole, this is a must for any fish lover. Langostinos (lobsters) – Warm water lobsters are in abundance, and affordable for most who want to try them. Agave Azul – Sabores de Mexico – Calle 14 #3 – 74, adjacent La Brisa Loca in Centro. 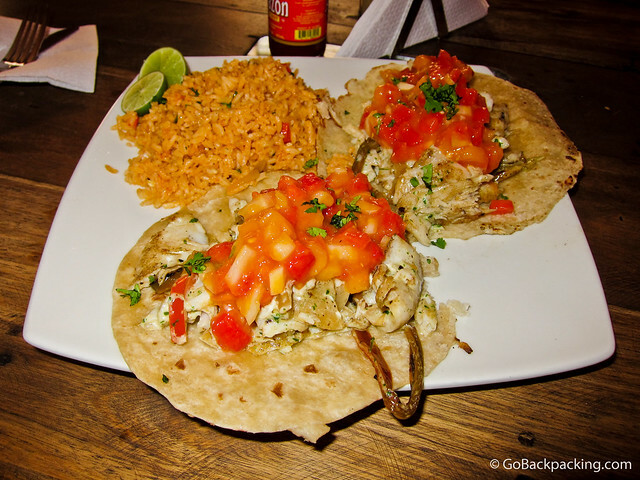 Excellent Mexican food, and happy hour drink specials. Ben and Joseph's Bar & Restaurant – Carrera 1 # 18 – 67, Centro. On the road running parallel the city's main beach and marina. Santa Marta's nightlife scene is more on the scale of pueblo than big city. The city doesn't have a Zona Rosa, or main nightlife district, however there are a bunch of small bars and clubs around Parque de los Novios in Centro, as well as bigger clubs in the upscale Rodadero suburb to the south. It may sound counterintuitive, but if you're looking to party on the weekends, head for Taganga, which offers several open-air discotecas along the beachfront. As Taganga and Santa Marta are as much vacation destinations for Colombians as foreigners, you can expect a decent mix of people. If you're staying in Taganga, it'll be a short walk, otherwise it's about a 10,000 peso ($6) taxi ride from central Santa Marta. El Garaje – Calle 8 + Carrera 3, Taganga. Popular bar on Wednesday and Saturday nights. La Puerta – Calle 17 #2 – 29, Santa Marta. One of the most popular clubs in central Santa Marta. If (open) drug use bothers you, go elsewhere. Sensations – Calle 14 #1 – 04, Taganga. Open-air crossover club.